With growing technology an effect can be seen that world is coming closer while the people are moving apart getting suitable Matrimonial alliances through relatives and friends is not possible whereas through Pandits and Brahmins unreliable hence Matrimonial Software becomes useful and best solution for matrimonial services website. We have included many features which user can use and take full benefit of the Matrimonial Software. 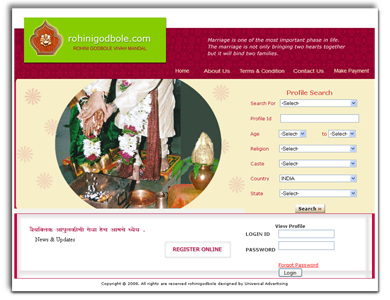 This is very powerful and useful online Matrimony Management System. Specialty of Matrimony Management Package System is it is user friendly. Special features are User can search, add, delete, edit or update their profile from the database and can upload their images or photos to the database. My accepted Members to see which members they have requested. Edit Profile to edit the profile: It is again sent for scrutiny by admin. Contact Now: If a user status is set to paid then they can send personalized message, otherwise a default message will be sent to other user indicating that the member have contacted you. To manage the FAQ Section. To manage the guest book. To manage the family values. To manage the mother tongue. To enable the guest book entries. and much more ... to come in new version. Free updates for one year..